Hi, My big problem is when I put my dough balls on the pan and wrap it with the plastic wrap the wrap sticks to the dough balls so bad there is not skin left when I unwrap them. Anyone have a solution ? You can use individual plastic bowls with lids hold your dough balls. Also, it might be the type of wrap you're using or how tightly the balls are being wrapped. A very thin coating of oil on the dough ball might prevent this, but depending on the type of dough you're making, I wouldn't necessarily recommend it. Raj's advice is spot on, Kim. 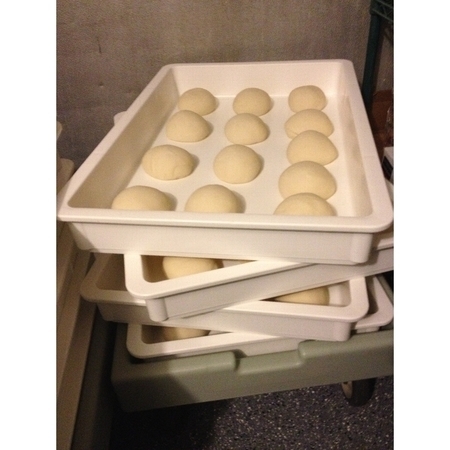 On top of what Raj suggested you might want to look into plastic dough boxes with a lid. I've done the individual container thing, the plastic wrap and even old-fashioned wooden dough boxes but I found that a solid plastic dough box with a lid, which can hold six or more, depending on size, are very good. Just brush the top with a very light coat of EVOO, put the lid on, place them in the fridge (lowest rack) and you should be good. There are multiple options available to you. Raj and Mike have outlined some good ones for use with plastic wrap. I have found that EVOO works, splashing water off of my finger tips works not quite as well, as does spritzing water over the top of the dough works ( I have an Alton Brown green dragon thatis fun, but there are others). What works is humidity. You goal is to keep a skin from forming on your dough and to not inhibit the dough expansion during the cold fermentation, and EVOO probably is best if you want to continue to use plastic wrap. I originally did that using plastic wrap over a 1/2 sheet pan. I now use either aluminum dough pans with lids and/or Cambro 2qt. round storage containers with covers. I think the dough pans to which Mike refers are good, but they take up lots of valuable refrigerator space considering that i usually am not "incubating" more than 4 balls at a time. The aluminum dough pans are cheap if you look around the web, but the plastic containers made by Glad, I think it is, are good, if somewhat on the small side for the amounts of dough called for in the Master recipes.. BTW, I have found that the amount of water that I use to keep the dough surface moist is negligible and does not require any alteration in the amount of flour in any recipe ( besides, since Raj has encouraged me to explore working with greater amounts of hydration, I now tend to favor working with wetter dough anyway). Enjoy the journey and pass along any tips you discover! But if you're really short on fridge space, Ken and Raj's tips are perfect. It looks like you have a number of these trays. Do you have a restaurant? I had found this from DoughMate, but I did not purchase it for space reasons even though it would fit in a refrigerator: http://www.doughmate.com/artisanproducttrays.html do you have a different reco? Ken, lol...no, I don't have a restaurant but working on it. It's in the planning phase. The pic you see was pulled off the Net for illustration purposes. The ones in the link you posted are basically the same. My recommendation is perhaps half sheet-size food-safe plastic trays, preferably with a lid. I think Nordic makes those. Maybe Raj knows more and can chime in to help you out. Ken and Mike, I bought a few of these back in the day. They were made by Cambro I believe. The exact size I don't remember, but they fit in my fridge after I took everything out. It just wasn't practical. The ones I had were probably half the size of these . Regardless of the manufacturer, they looked exactly like these. I'll try to find the exact model tomorrow morning. I bought them from Economy Restaurant Supply in SF. No kidding? Where will the restaurant be located? Marin County. But it's very early in the planning. Give me about a month lead time to arrange it, and we will come for your grand opening! !